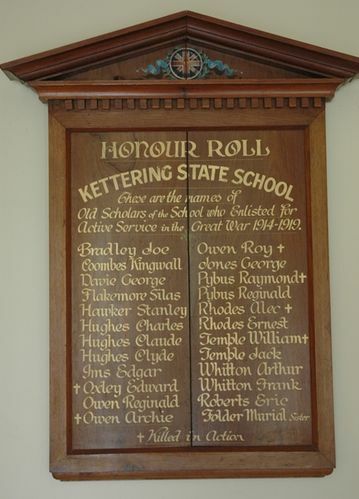 The unveiling of the roll at the Kettering State School took place last week. The ceremony was performed by the Warden of Kingborough (Mr B Pearsall ) in the presence of a very large gathering of parents, children and friends. The board is of polished blackwood, with gold leaf lettering and contains the names of 24 old scholars of the school including Sister Folder. All of them enlisted for active service and seven of them made the supreme sacrifice. The cost of the honour roll was met by subscriptions by parents and friends of the district. The Mercury (Hobart), 15th November 1920. These are the names of old scholars of the school who enlisted for active service in the Great War 1914 - 1919.